Small cars are becoming more and more popular. 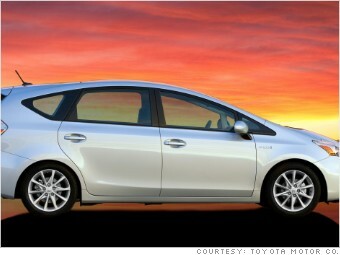 Partly it's about fuel economy but partly it's because small cars are getting better. They come nicely equipped and, more surprisingly, designer have figured out how to make them very big inside. In fact, some of these cars have an amazing amount of space to stash stuff, even without folding down the back seats. These are some of the cargo space vs. parking space champs. All fuel economy figures given here are EPA estimates for versions with automatic transmissions. At 181 inches, the Prius V is the biggest of the cars here but its cargo space is positively cavernous. Sure, it offers all the fun and excitement of a tepid bath, but, if you want a practical, fuel-efficient car, this is it.